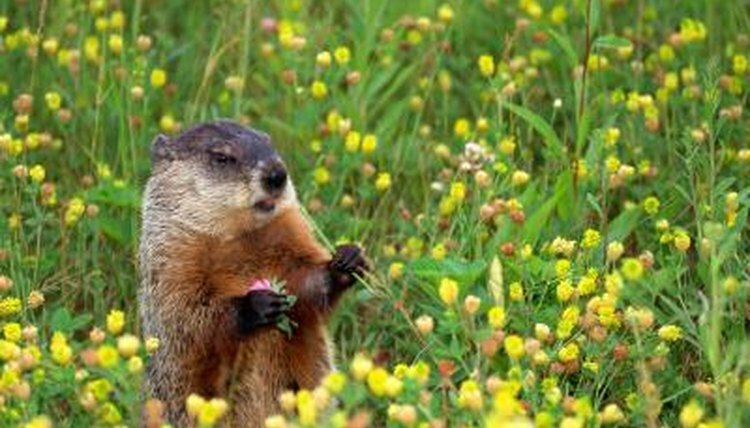 Groundhogs, also called woodchucks, spend the warmer months eating to build up the fat layers they need to survive a winter in hibernation. A member of the squirrel family, groundhogs are typically between 7 and 14 pounds. They create deep dens to keep them protected as they sleep away the winter. Groundhogs are typically active until the first real frost of winter, often October or November. Then they crawl down into their burrows and begin to hibernate. This hibernation lasts until the weather starts to warm up, usually around February or March. Although they can hibernate for up to five months, some hibernate for only two to three months, depending on temperatures in the area. As the days shorten, temperatures drop and plants begin to die or go dormant for the winter, a groundhog's body releases a hormone that helps guide the animal into hibernation until the weather warms and the days begin to grow longer. Groundhogs undergo a severe change as they relax into a hibernation state. A groundhog's heart rate slows from between 80 and 100 beats per minute to around four or five beats per minute. They don't wake up to eat; instead, their bodies, which have reduced nutrition needs while hibernating, feed on the fat layer the groundhogs built up in the summer and fall. A groundhog's body stays barely above the ambient temperature in the burrow, falling from 98 degrees Fahrenheit to as low as 38 degrees. Groundhogs spend a good bit of the warmer months getting ready for hibernation. Females have babies early in the spring, usually in late March or early April. This gives the babies time to mature through the summer so they can dig their own dens for the winter. A groundhog eats nearly a pound of food per day in the fall to help build up his fat stores, and he digs a deep den that he lines with grass or twigs to make a comfy nest for his long nap. Groundhog hibernation is the focus of several types of studies that are trying to find ways to improve people's health. For example, the groundhog's brain doesn't need the same amount of oxygen when hibernating as it does when he's awake, and scientists are trying to find a way to apply a "hibernating" principle to a human brain to help alleviate stroke damage. Also, scientists are studying the hormone that helps groundhogs relax into hibernation for application with transplant and heart attack patients. What Does a Hamster Look Like When It's About to Hibernate? How Long Do Worms Stay in Hibernation?